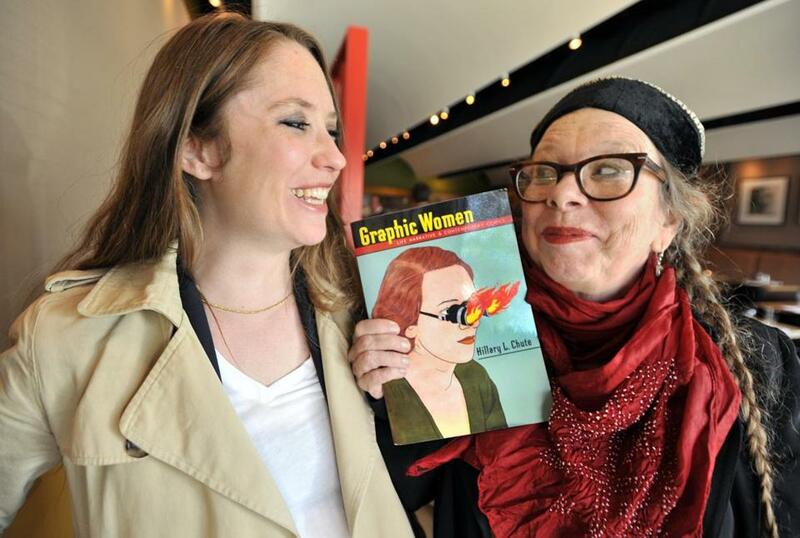 “Why Comics?” author Hillary Chute (left) with cartoonist Lynda Barry. Comics as a form is about “distillation and condensation,” writes Hillary Chute in her probing and engrossing new book, “Why Comics? : From Underground to Everywhere’’ (Harper). The book by the Northeastern professor and Cambridge resident details the evolution of the form, scrutinizing early cartoons in newspapers and magazines, the mimeographed pamphlets of the ’zine movement, the rise of the superhero, and why “graphic novel” is a problematic categorization. She demonstrates how comics are uniquely suited to exploring our darkest, hardest, and most complex hours, confronting issues and events like war, the Holocaust, sexuality, and violence. The book, richly illustrated by a number of historic and current-day examples, also gives portraits of some of the masters of the form including Lynda Barry, Marjane Satrapi, Alison Bechdel, Chris Ware, Art Spiegelman, Joe Sacco, Allie Brosh, and others. The book is a comprehensive guide to a genre that continues to evolve and rise, occupying a specific place between rebellion and high literature. Boston poet Tara Skurtu has been living in Romania on an extended Fulbright fellowship, teaching creative writing in Bucharest, and she’s just released her first full-length collection of poems, which brings her back home this week for readings. “The Amoeba Game’’ (Eyewear) deposits us on the southern tip of Florida, in prison visiting rooms, on Romanian side streets and markets; we come to know a father who invents shapes and cracks wise to cops, a troubled sister, poet pals, and loves. Her imagery, of the simple and familiar, sears itself on the mind: a fly is caught in a trap, “its body puttied/ to the glue strip, legs waving/ like six wet strokes of black ink.” Skurtu’s poems — wise, wry, probing — grapple with God and language, with the strange futures that unfold for us all. Skurtu will read from her book on Jan. 9, with Lloyd Schwartz, at the Grolier Poetry Book Shop in Cambridge and on Jan. 13 at Porter Square Books. Raina Telgemeier, a San Francisco author, illustrator, and graphic novelist, was recently named as the speaker for the second annual Margret and H.A. Rey Curious George Lecture Series at the Cambridge Public Library. Telgemeier’s graphic memoir “Smile,’’ recounts an accident that knocked out her two front teeth and the aftermath, surgical and social, of the event. Her most recent book, “Ghosts’’ explores a family’s move for the sake of helping a little sister’s cystic fibrosis and circles around Day of the Dead traditions. Besides these bestsellers, she’s also done graphic novel versions of the Babysitters Club series. The lectures are a collaboration between the library and the Curious George Foundation, established by the estate of the Reys, who were longtime Cambridge residents. The event will take place March 15 at the main branch of the Cambridge Public Library.